Look up leaf vegetable in Wiktionary, the free dictionary. Leaf vegetables, also called leafy greens, salad greens, pot herbs, vegetable greens, or simply greens, are plant leaves eaten as a vegetable, sometimes accompanied by tender petioles and shoots. Although they come from a very wide variety of plants, most share a great deal with other leaf vegetables in nutrition and cooking methods. Nearly one thousand species of plants with edible leaves are known. Leaf vegetables most often come from short-lived herbaceous plants, such as lettuce and spinach. Woody plants of various species also provide edible leaves. The leaves of many fodder crops are also edible for humans, but usually only eaten under famine conditions. Examples include alfalfa, clover, most grasses, including wheat and barley. These plants are often much more prolific than traditional leaf vegetables, but exploitation of their rich nutrition is difficult, due to their high fiber content. This can be overcome by further processing such as drying and grinding into powder or pulping and pressing for juice. Leaf vegetables contain many typical plant nutrients, but since they are photosynthetic tissues, their vitamin K levels are particularly notable. Phylloquinone, the most common form of the vitamin, is directly involved in photosynthesis. This causes leaf vegetables to be the primary food class that interacts significantly with the anticoagulant warfarin. The vitamin K content of leaf vegetables is particularly high, since these are photosynthetic tissues and phylloquinone is involved in photosynthesis. Accordingly, users of vitamin K antagonist medications, such as warfarin, must take special care to limit consumption of leaf vegetables. If leaves are cooked for food, they may be referred to as boiled greens. Leaf vegetables may be stir-fried, stewed, steamed, or consumed raw. Leaf vegetables stewed with pork is a traditional dish in soul food and Southern U.S. cuisine. They are also commonly eaten in a variety of South Asian dishes such as saag. Leafy greens can be used to wrap other ingredients into an edible package in a manner similar to a tortilla. 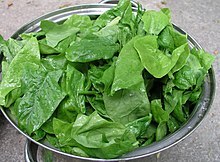 Many green leafy vegetables, such as lettuce or spinach, can also be eaten raw, for example in sandwiches or salads. A green smoothie enables large quantities of raw leafy greens to be consumed by blending the leaves with fruit and water. In certain countries of Africa, various species of nutritious amaranth are very widely eaten boiled. Celosia argentea var. argentea or "Lagos spinach" is one of the main boiled greens in West African cuisine. In Greek cuisine, khorta (χόρτα, literally 'greens') are a common side dish, eaten hot or cold and usually seasoned with olive oil and lemon. At least 80 different kinds of greens are used, depending on the area and season, including black mustard, dandelion, wild sorrel, chicory, fennel, chard, kale, mallow, black nightshade, lamb's quarters, wild leeks, hoary mustard, charlock, smooth sow thistle and even the fresh leaves of the caper plant. Preboggion, a mixture of different wild boiled greens, is used in Ligurian cuisine to stuff ravioli and pansoti. One of the main ingredients of preboggion are borage (Borago officinalis) leaves. Preboggion is also sometimes added to minestrone soup and frittata. In the cuisine of the Southern United States and traditional African-American cuisine, turnip, collard, kale, garden cress, dandelion, mustard, and pokeweed greens are commonly cooked, and often served with pieces of ham or bacon. The boiling water, called potlikker, is used as broth. Water in which pokeweed has been prepared contains toxins removed by the boiling, and should be discarded. ^ "Nutrition facts for raw spinach per 100 g; USDA Nutrient Data SR-21". Conde Nast. 2014. Retrieved 15 Sep 2014. ^ Kessler, F.; Glauser, G. (2014). "Prenylquinone Profiling in Whole Leaves and Chloroplast Subfractions". Plant Isoprenoids. Methods in Molecular Biology. 1153. p. 213. doi:10.1007/978-1-4939-0606-2_15. ISBN 978-1-4939-0605-5. ^ Chang, C. -H.; Wang, Y. -W.; Yeh Liu, P. -Y.; Kao Yang, Y. -H. (2014). "A practical approach to minimize the interaction of dietary vitamin K with warfarin". Journal of Clinical Pharmacy and Therapeutics. 39 (1): 56–60. doi:10.1111/jcpt.12104. PMID 24383939. ^ Lynn Livanos Athan. "Horta Vrasta - Boiled Leafy Greens". About.com Food. ^ "dall'olio al preboggion". cogornese.it. ^ "Liguria-style omelette with borage and sausage". Italian recipes - Italian food culture - Academia Barilla.